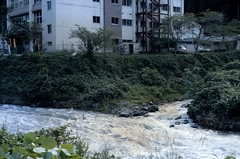 河野勝行 (1984) コブハサミムシの特異な生活－生活史戦略的視点から－ 遺伝 38(10): 70-75. 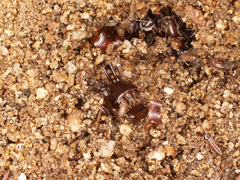 Kohno K. (1997) Possible influences of habitat characteristics on the evolution of semelparity and cannibalism in the hump earwig Anechura harmandi. Res. Popul. Ecol. 39(1): 11-16. 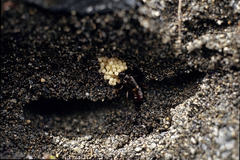 Suzuki S., Kitamura M. and Matsubayashi K. (2005) Matriphagy in the hump earwig, Anechura harmandi (Dermaptera: Forficulidae), increases the survival rates of the offspring. J. Ethol. 23 (2): 211-213.